Enclosed is an article written by one of my students and a picture from our May 6th Learnball Tournament. We are in the toddler stage here now, but we are ready to have a tournament or two at the bi-monthly meeting of the Parent Teacher Organization. We are now on the last question of our Learnball Tournament. And...the answer was correct! Points to the Energizers. Score - Energizers, Inc.,1,875, Eveready Company, 1,840. I'm calling a freeze in five seconds, 5-4-3-2-1 Freeze......Freeze over. A great job, teams. 50 points for each company. Let's shoot now. Eveready first. Come on, Eveready, hustle! SWHISH! Nice shot! Does this sound familiar, or do you not have any idea what it is? It's Learnball, an exciting learning experience. In St. Mary Middle School, Sr. Mary Celine has introduced this fun program. All of my friends like to participate in Learnball. We enjoy shooting every day and the occasional surprize of a freeze. It is fun to have a turn at being a contest manager or one of the other officials. I can definitely say that my classmates and I enjoy our Learnball Tournament, an ingenious, cooperative, learning experience! Learnball has helped everyone in our class to be on time when the bell rings, and it helps us do our homework. Learnball is so much fun! It hooks everyone into doing homework. Learnball is great! There are fewer absences and much more homework done since we formed our teams because now we have team spirit. Thank you for helping us to find a better way to learn. Learnball is great because kids learn to pay attention and participate. Everyone on the team has a special job. I really think this system works! Our room is cleaner. Everyone is a lot quieter and a whole lot more hard working. I wish every teacher used Learnball. I like earning points for my team. Learnball puts order and fun into the classroom. 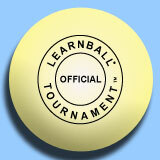 I like Learnball because it is challenging. It’s hard work and teamwork. It should be used everywhere. I think Learnball gives a new meaning to the word "school." Most kids don’t like school, but as soon as they get the hang of Learnball, they start to love school. Learnball teaches us to follow rules, show respect, and cooperate. Learnball teaches us to be responsible. It helps people who are used to goofing off. Some of the worst kids in our classthe ones who used to really goof offare changing for the better. Now, they bring their assignments in on time, they don’t yell out nearly as much, and they get better grades. It not only helps the kids, it also helps the teacher. Before Learnball, my teacher was always yelling. But nowadays, she just counts to five and the class is quiet. I love Learnball. Thanks for bringing fun and joy into our room.